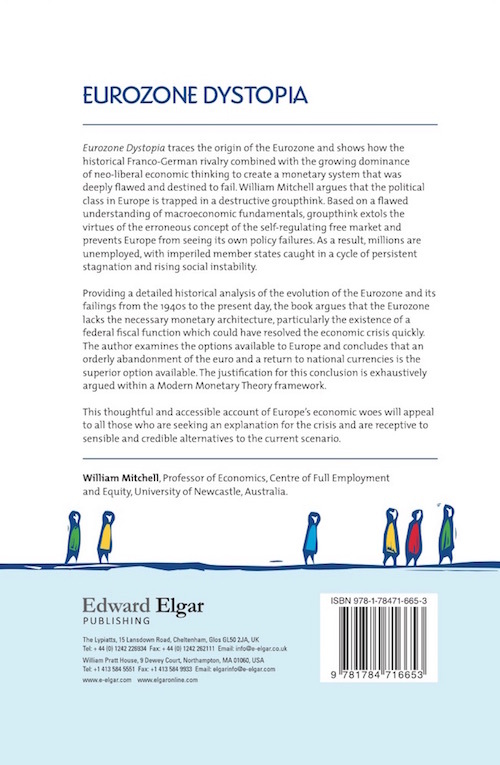 Edward Elgar, who is publishing the English language version of the book – to be released in May 2015, sent me the proposed front and back covers for approval last night. You can guess what colours I like. Here they are for your (possible) interest and so you will easily recognise it when you go to the bookshop :-). Whether the German and Italian editions, which are currently in the process of translation, have the same cover will depend on whether EE will give me the rights. But it is likely that the graphic will be the same because I have the rights to that. Anyway, just three pictures in this blog. And I should add that the book cover was selected months ago and so was before this great cartoon from the Irish Times cartoonist – Martyn Turner – which appeared on February 21, 2015. Ps: that makes it four pictures. Great cover. Any idea on price? To see these jurisdictions as nations in the true English or French Medieval sense is grossly false. They are mere corporate conduits. Only social credit theory can adequately explain the darkly absurd need to burn through capital good so as to access purchasing power. The Ukraine crisis was /is clearly a bid to reduce the size of the euro scarcity engine using military means with Russian car sales now tanking in January and exploding in extreme conduits such a Ireland. Irish car sales up 73 % in January vs Jan 2013. I am really looking forward to reading this! I hope it is going to be available in paperback not just one of those £80+ hardbacks that are out of budget range. Do you have a Spanish version in mind? Bill, looks great. Till now maybe not a reader, but the cover and title (and familiarity with your axe-grinding) make it quite tempting. Re “jurisdictions as nations … They are mere corporate conduits” – Currently getting a crash lesson on geopolitics via Pepe’s Globalistan/Corporatistan tome. His impressive and informed grasp of ‘how the world works’ makes it depressingly clear corporations have us – and our ‘nations’ – by the short curly bits. Does not bode well that these mindless selfish behemoths now run the globe. EE rarely cater for the poor when it comes to book prices. I hope this will be one of those rare occasions. 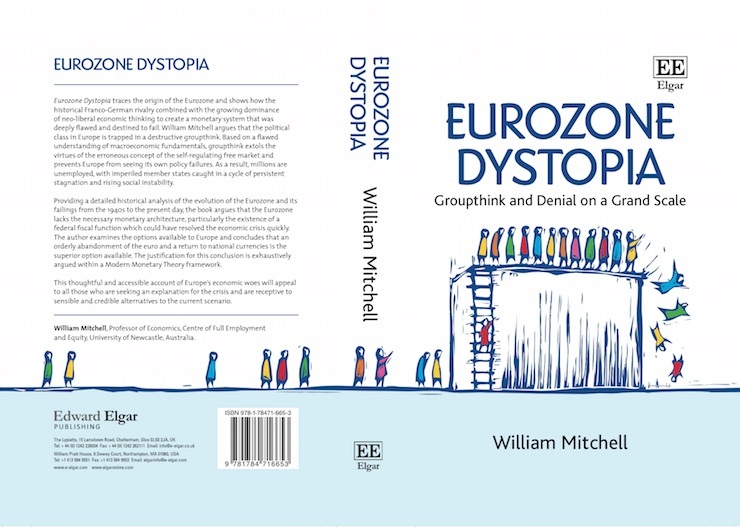 Thanks for questions relating to my soon-to-be-released book on the Eurozone. I published the English-version through Edward Elgar because I have had a very good past publishing experience with them. I know the owner and his staff are excellent. The final production, though it takes time (they have had the manuscript since early August), is first-class. I also know that their business model is to make their costs back on hardback copies they sell to libraries etc. The prices are high relative and they usually do not release a cheaper softcover version until two after the first date of release. Knowing that, I negotiated an arrangement in the contract which would help to make the book more uniformly available across income cohorts. 1. The soft cover will come out 12 months after the hard cover instead of the usual 24 months. 2. There will be an ebook available immediately (in May 2015) at a low price, which you can then print (if you need to read hard copy). EE agreed to be somewhat flexible in their usual business model after I requested these concessions. But it is a long book (over 400 pages) and the costs of production are not low. So the arrangement was the best I could come up with, respecting that they are a commercial publisher (one of the best) and that their usual market is not the broad reader (they mostly do academic type books). My book was written to be a sort of ‘airport’ book although whether I succeeded is another matter. EE have been marvellous in the way they have expanded their usual business model to accommodate this nuance. If anyone out there is really unable to buy the E-book version then they can write to me and I will see what can be done. I will make no money from the sales (I also sacrificed substantial royalty payments as an inducement for EE to alter their usual business model in this case). 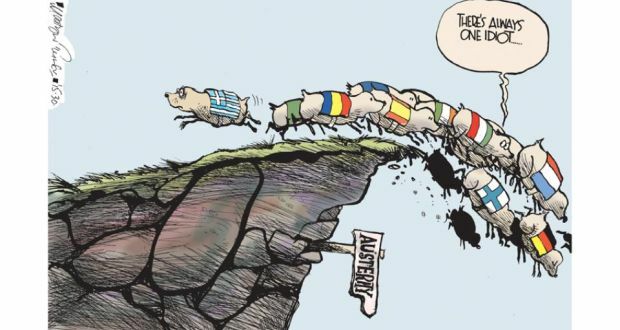 Interesting cartoon, but is Syriza really running in the opposite direction to the rest of the crowd? In other words, it would appear that the platform on which Syriza won the recent general election has been significantly reconstructed. On my to-buy list. Congratulations Bill and here’s hoping it helps raise awareness of the destruction course Europe has charted for itself. Any news on when and who will publish your MMT textbook (your blog still says it’ll be published in 2014)? 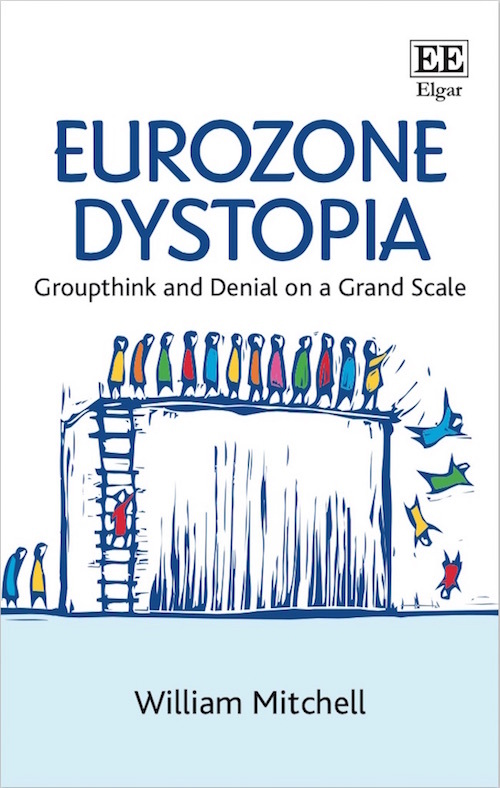 I’ll certainly buy the Eurozone book as soon as it’s out, but the MMT textbook is the one I’m really looking forward to. I know the MMT textbook will be a technical, academic-style book, so I’ve been reading the intermediate macro textbooks by Dornbusch, Fischer, etc and by Blanchard. Will this be helpful, or are there more useful texts that would prepare for the radically different MMT approach? In preparation, I’ve already read Randall Wray’s two excellent books on modern money. By the way, Bill, I saw Richard Werner give an interesting way for Greece to free itself from the clutches of the troika. The state can ask/demand Greek commercial banks to create all the money necessary for the state to run itself, and put up state assets as collateral to insure the loan. What say you? Can you say when will the Italian edition be out, approximately, and with what title? Thanks!! I cannot give a deadline for the publication of the Italian version. The title will remain the same as the English version (except in Italian). The Spanish version will be published in November 2015. The English version in May 2015. The German version will be sometime in 2016. Looks like a wonderful book, but too expensive for me. I will,have to wait till it comes to the local library. Liz Wager, Edward Elgar Marketing Dept.